As we told you last week, RLSB's London Without Limits festival is back, letting everyone experience what life is like for young blind people living in London, and there's a festival launch party this afternoon. Head to Carnaby from 4.30pm today to join in the fun. 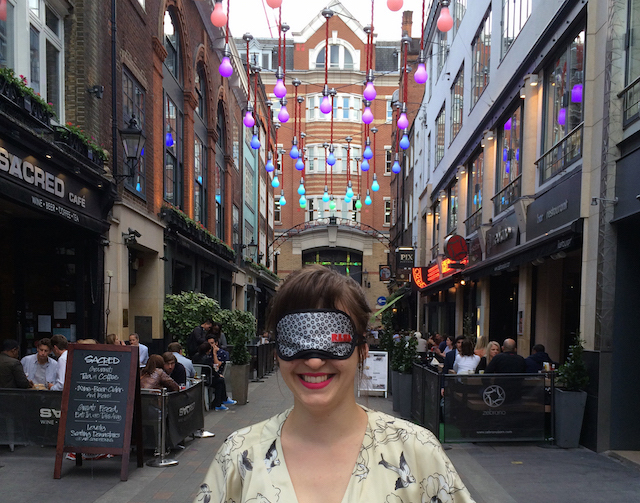 Take part in blindfolded activities such as arts and crafts, and smoothie and cocktail tasting — without your sight, your other senses are heightened, making for a more intense sensory experience. You can even take part in a yin yoga class blindfolded, thanks to Triyoga. There's a recommended donation of £15, and you can book here. Blind beauty blogger Lucy Edwards will be giving a talk at Benefit at 6.30pm, discussing her experiences as a blind beauty blogger, offering make up tips and launching the #blindfoldbeautician beauty challenge. On top of these activities, several shops and restaurants in the area, including Bolongaro Trevor, Carnaby Burger Co and Lomography, are offering discounts to everyone taking part in the festival — make sure you download your voucher here (PDF). London Without Limits runs from 29 June to 30 July. Check out all events online. Londonist is proud media partner to London Without Limits.